Since you’re on Pinterest Board Organization part 2, I’m assuming you’ve completed part 1 and selected a board that’s overrun by pins and not user-friendly–either for you or for your followers. If not, you can go back and catch up quickly and then jump back over to this post. 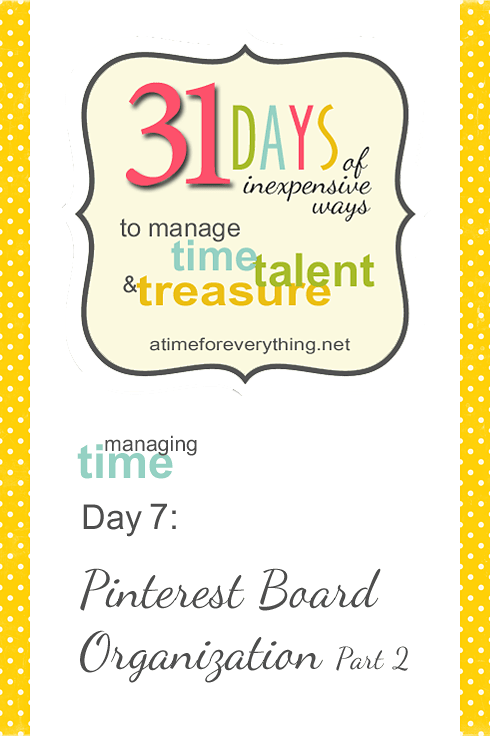 Your next assignment is to take that crazy board and make a list of more specific boards it can be broken down into for ease of finding things you’ve pinned. The number of boards will depend on the subject and the amount of pins, but I would encourage at least three. Last year I completed this process with my recipes board. 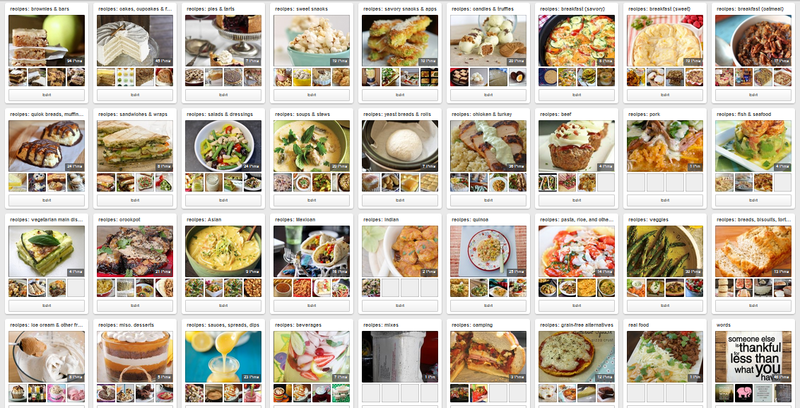 I had pinned every single type of recipe to it, so it became impossible to visually scan it and find what I wanted. I decided to divide it into lots of very specific boards. I did this simply because if I was going to put the time into organizing my recipes onto new boards, I wanted the format to be incredibly useful. I ended up with 36 different recipe boards! Yes, that is a lot. And yes, it took me a few hours. But every single time I pin a recipe or look for a pin, I am so thankful that I did it. In many ways Pinterest has become my cookbook, and this has made it so much easier. It’s like having a table of contents. The one I’m going to tackle along with you is my Sew board. Right now it has about 200 pins, and I can definitely do a better job of categorizing them. So make that list and come back tomorrow to finish the task. I’m going to attempt my first video tutorial for those of you who learn better by watching, pausing, and doing!